Chevron’s massive Tank Farm Road remediation and commercial project in San Luis Obispo took a big step forward on Sept. 2 as the City Council unanimously approved the final environmental impact report for the 332-acre site. The City Council also approved several amendments to the airport area specific plan. The approvals pave the way for Chevron and the city to solidify a development pact and begin the permitting process for remediation of the site, which the county will ultimately oversee. The property is expected to be annexed to the city either during or once the remediation is completed over the next three years. After that, development review and permitting of industrial and commercials uses can start. Negotiations regarding the development agreement, which would give Chevron the rights to build out the property over the next 25 years, are ongoing, she said. The agreement would also require the city of San Luis Obispo to sign a development pact with Chevron in which taxpayers would reimburse the energy giant for about $11 million in public infrastructure costs. Such agreements with developers are not unusual if the company agrees to build out more than its “fair share” of the necessary infrastructure. Chevron says its project, which includes a business park at full build-out, will act as a catalyst for private-sector development in that portion of San Luis Obispo by widening Tank Farm Road to four lanes, extending Sante Fe Road to the north and south, adding traffic signals to the Tank Farm and Sante Fe intersection, and adding bicycle lanes. Chevron wants to develop 53 acres of the 332-acre Tank Farm site, with 800,000 square feet of business park and commercial uses. Development would be implemented in five phases over a period of approximately 25 years; each phase would create approximately 160,000 square feet of leasable floor area. About 15 acres are designated for recreational use. 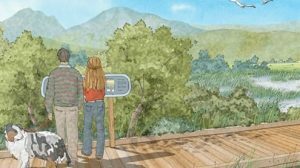 The largest portion of the project is the massive restoration of the remaining 250 acres, which will be kept as open space. When the commercial portion is finished sometime in the next 25 years, it will host about 1,800 jobs and generate $1.6 million in annual tax revenue for the city, Chevron has said. The project would generate about 500 temporary construction jobs, the company estimated, and it would pay $10.8 million in one-time fees and sales tax to the city when it begins development. Chevron has said it will spend $17.4 million on regional infrastructure improvements. Its portion of the airport specific plan’s impact fees — what it will have to pay into the infrastructure pool — is $6.3 million. The $11.1 million difference is what the city will have to reimburse it for, Chevron has said. But the first step is cleanup of the former oil field, a phase Chevron expects will take about three years. A lightning storm in 1926 sparked a massive blaze that lasted five days and boiled the crude oil stored on the site into a sticky, tar-like substance. Chevron plans to remove that contamination, as well as the remaining crude oil storage structures on the property. Its plans also call for increasing the wetlands space and restoring the habitat for the endangered fairy shrimp — a small crustacean that held up the development of nearby Costco — and other wildlife on the property. The petroleum company says it will set up an endowment for the continued maintenance of the open space.